How did A Love To Last and Meant To Be fare in the ratings game? 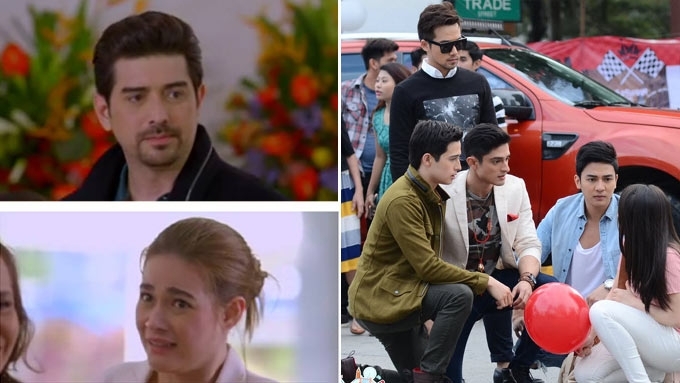 ABS-CBN's A Love To Last is topbilled by Ian Veneracion and Bea Alonzo (left frame) while GMA-7's Meant To Be stars Ken Chan (right frame, standing), Ivan Dorschner, Addy Raj, Jak Roberto, and Barbie Forteza. Two primetime shows aired their pilot episodes last night, January 9, 2017. These were ABS-CBN's A Love To Last topbilled by Bea Alonzo and Ian Veneracion and GMA-7's Meant To Be starring Barbie Forteza and her four leading men. MEANT TO BE. In the GMA-7 teleserye Meant To Be, Barbie Forteza is cast as Billie, a call center agent. Ivan Dorschner plays Ethan Spencer-Hughes, a handsome Filipino-British chef with a wicked sense of humor. He’ll slowly fall for Billie’s (Barbie) charms even though he deeply loves his Filipina girlfriend. Addy Raj is Jai Patel, the funny and sometimes naughty Indian from Mumbai, India. His life tends to burst into a song and dance number. Among the boys, he is the happy-go-lucky and less serious guy. Jak is Andoy Dela Cruz. He is the youngest among the boys and is a pure Pinoy promdi whose torpe and shy when it comes to girls. Unlike his friends, he is just from a middle class family. Finally, there is Ken Chan who plays the role of Yuan Lee, a Chinoy bad boy who doesn’t warm up to people easily. At first, Yuan and Billie don’t get along but as they spend time together, he’ll fall for her charisma. Billie will eventually torn between the Gentleman from United Kingdom (Ivan), the Naughty Guy from Mumbai (Addy), the Pure Pinoy Promdi (Jak), and the Chinoy Bad Boy (Ken). A LOVE TO LAST. ABS-CBN's opening salvo for 2017 is the Bea Alonzo-Ian Veneracion starrer A Love To Last, which is a timely story about family and how love isn’t always what it seems to be. Andeng Agoncillo (Bea Alonzo) is a bread-winner and a successful events organizer who has always believed in love. For her, love is being with the man she loves and eventually having a happy family with him. Anton Noble IV (Ian Veneracion) thought he already found love. But after many years of marriage, his wife Grace (Iza Calzado) decides to leave him and demands for an annulment. He is then left with their three children and becomes a single father, on top of his responsibility as a president and CEO of his company. Fate brings Andeng and Anton together in the most unexpected time and place. Never has Andeng imagined that she will find love with a much older man. As she takes this risk, she also finds herself caught in the middle of Anton’s complicated life of dealing with an ex-wife and seeking acceptance from his kids. AGB NIELSEN. The Kapamilya series A Love To Last aired from 8:40 pm to 9:49 pm last night, January 9. The Bea-Ian teleserye was pitted against Dingdong Dantes's primetime series Alyas Robin Hood. Based on AGB Nielsen's NUTAM (National Urban Television Audience Measurement) ratings, A Love To Last registered a TV rating of 17.8% while Alyas Robin Hood got 21.6%. KANTAR MEDIA/TNS. Based on nationwide ratings data from Kantar Media/TNS, the new Kapamilya show was able to get a 5.2-point lead over its counterpart program. Bea and Ian's teleserye A Love To Last got 25% while its rival show Alyas Robin Hood registered 19.8%. PEPsters, what can you say about the pilot episodes of A Love To Last and Meant To Be?